Dr. Starobin's responsibilities for Ecolab include food safety, environmental testing, equipment evaluation, outbreak prevention and recovery, regulatory product development and research for Ecolab QSR and food retail customers in the U.S. and internationally. She has more than 20 years of experience managing a microbiology laboratory and is a member of several industry organizations, including the International Association for Food Protection, Institute of Food Technologists, American Society for Testing and Materials and Conference for Food Protection. Register for this month’s Food Safety Matters Webinar. 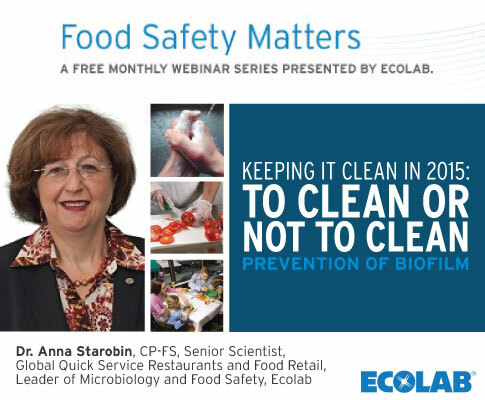 Ecolab’s Food Safety Matters Webinars are free monthly web presentations featuring food industry, academic, regulatory and culinary experts presenting topics surrounding the diverse aspects of food safety. Monthly webinar topics range from daily food handling situations to pest control, implications of regulatory changes, microbial risks such as norovirus, and more. For more Ecolab news and information, visit ecolab.com. Follow us on Twitter @ecolab, Instagram @ecolab_inc, Facebook at facebook.com/ecolab and LinkedIn at linkedin.com/company/ecolab.